San Francisco in One Day – Beyond the Basics – Ximena. I wanted to create a quick guide of some of my favorite things to do and see in San Francisco. This would be perfect for the person who has already done the basics like the Golden Gate Bridge, China Town, Fishermans Warf, Union Square etc. It’s been 4 years since I lived in San Francisco (but 8 years of living in the Bay) and being unemployed has given me the chance to love it again. 1. Start in the Mission District, once a grittier area for immigrants it is now a gentrified bougie playground for the young techies. I am still a bit shocked from the changes that have occurred here in the last 8 years. It is 100%, one of the top districts in the city. 2. Valencia Street in the Mission is where you want to be. I would say the strip between Duboce and 25th is the most populated with shops and food. Take your time to stroll from block to block and be sure to look out for the mural alley. Grab a Valencia Corridor Map if you spot one, it’s a great free map of the area. The photo above was taken at Ritual Coffee Roasters. My other favorite places include Craftsman and Wolves, Boba Guys, Dog Eared Books, Love Story Yoga, and Tacolicious. 3. Tartine Bakery is a staple in the Mission and normally has a huge line going around the corner, so try going on a weekday. Pictured above is the latte, a bit small but the standard, high-quality you would expect in San Francisco. I am a big fan of their Croque Monsieur and like that you can choose your protein. If you can, be sure to pick up a loaf of bread or some pastries. 4. Down the block from Tartine is Dolores Park. If the whole city is gloomy, this park is still vibrant and energetic. This spot is great for people watching, dog watching, relaxing, and a bit of debauchery. Don’t be surprised to see people drinking beers out of brown paper bags or someone smoking…illegal substances. If the line isn’t atrocious, you can grab an ice cream from Bi Rite. 5. Jump in a Lyft to Haight-Ashbury, most tourists get a kick out this area but locals know there are still some cool bars and eateries in this area. My favorites are Cha Cha Cha, Magnolia Brewing, and The Alembic. 6. From here get on the 7 bus towards Gold Gate Park. 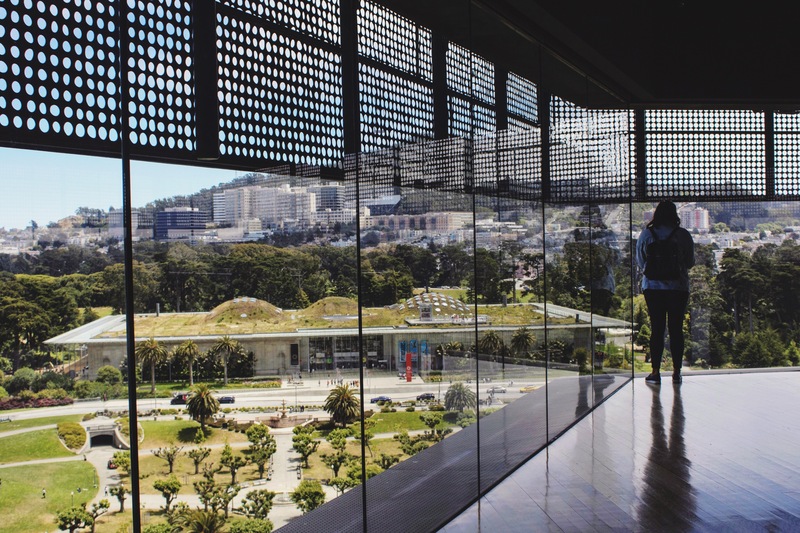 One of my favorite places to take visitors is the Observation Tower at the de Young Museum. You can by pass the rest of the museum, and go straight up to the top for no fee. You get a 360-degree view of the city where, on a clear day, you can see the Sunset district, the Richmond district, USF, UCSF, the Golden Gate Bridge, the rest of the park, etc. It is such an amazing view, I love it. In this area of the park, you can also visit the California Academy of Sciences, a living natural history museum, and the Japanese Tea Garden. The day ends here but I encourage you to stay in The Sunset district for dinner. I used to live here and it holds a special place in my heat. Many visitors won’t come out this far but there is a TON of amazing food and dive bars.